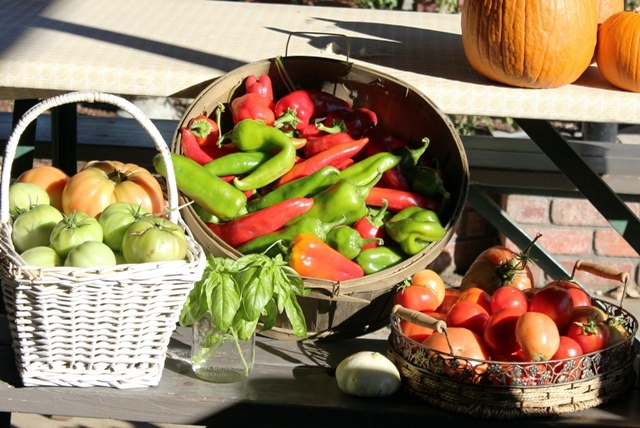 Today, I picked all the vegetables before another cold and rainy night would completly destroy what was left growing in my summer garden. 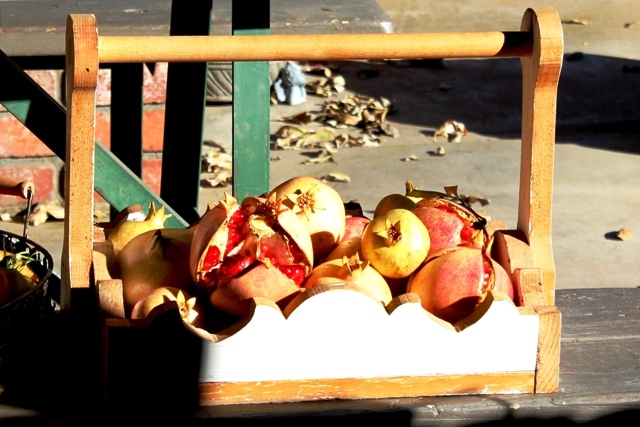 My Sweetheart has the job of picking the pomegranates off the tree, squeezing the juice and freezing it for the a wonderful winter beverage we enjoy so much. My pomegranate tree doesn't grow the dark rudy colored fruit that's sold in the grocery store, but a light colored skin and pale seeds. It was a sucker from my neighbor's tree and I transplanted it about 35 years ago. It does a great job of shading the plants underneath on the hot summer days and providing me with a delicious treat every fall. I get enough fruit for eating, juicing and decorating. 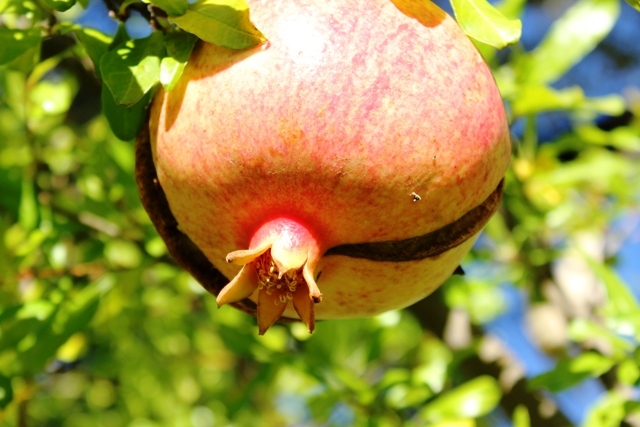 I think the pomegranate is the most beautiful and flavorful fruit. 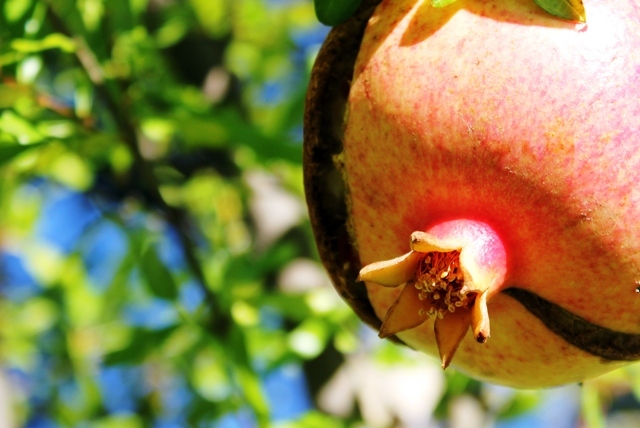 When I was young my sister and I would go to my grandmother's house in the summer and sit under a pomegranate tree with a towel around our necks to protect our clothes from the stains and eat as many pomegranates as we wanted. 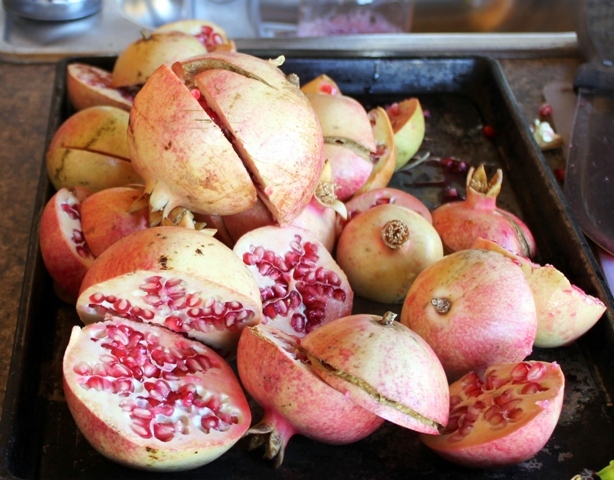 I was the champion of eating the most pomegranates and not wasting any seeds. 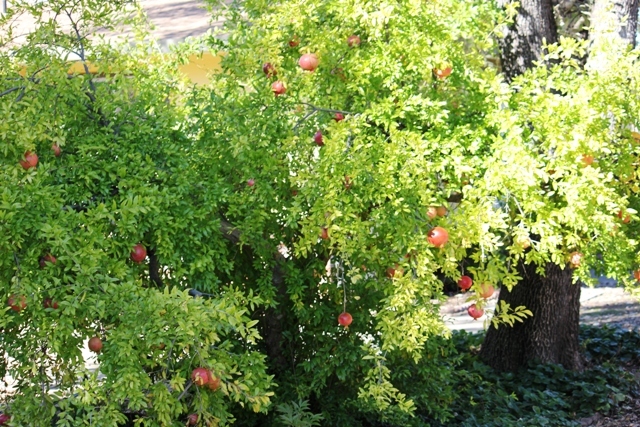 I think that's the reason I have always had a pomegranate tree. 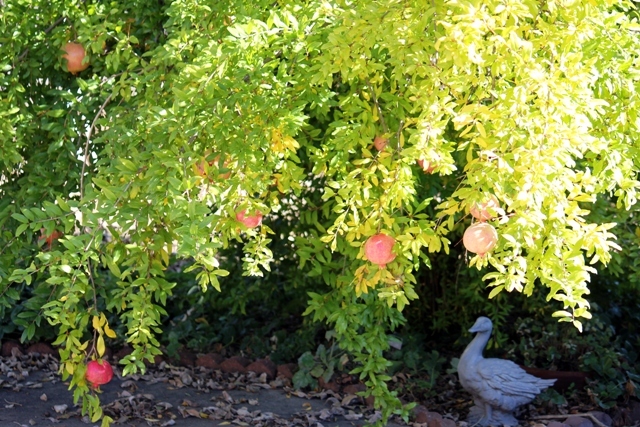 The strawberries, peony and hydrangea are shaded by the pomegranate tree. Now it's time to do some juice..... Yum!!!! 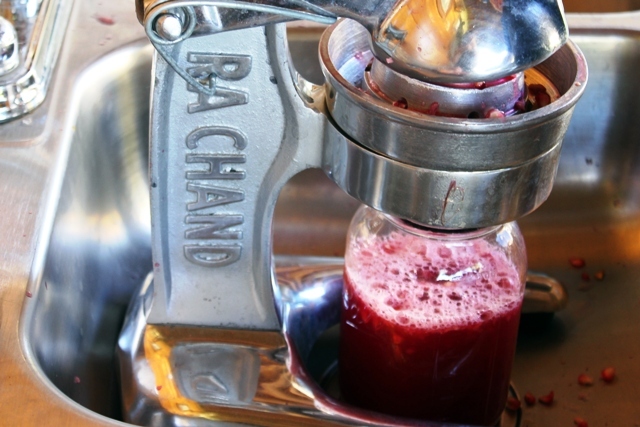 A very heavy duty press it needed to extract all the juice from the pomegranate. 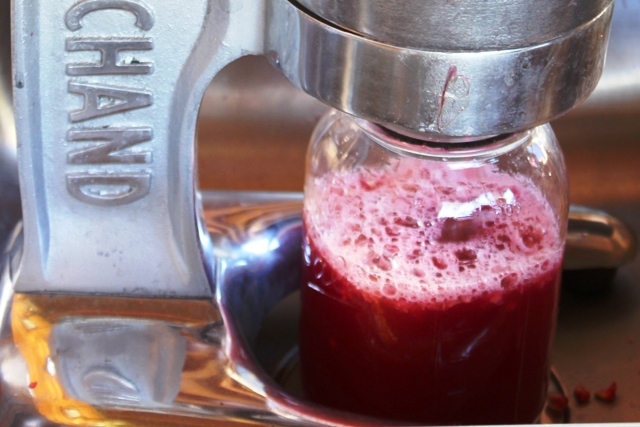 The juice is squeezed into a half gallon jar and then poured into freezer bags and frozen. I thaw when I need to make pomegranate jelly for Christmas gifts. Our family members love receiving a beautiful jar of the clear and flavorful jelly. I picked the red and green tomatoes. The red tomatoes I store in the refrigerator in the garage and the green tomatoes I put in a flat box with a tea towel over them and store them in the house. 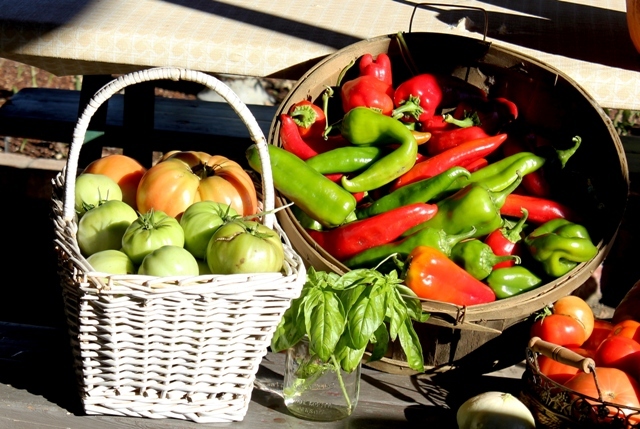 The green tomatoes will ripen just as if they were outside on a tomato vine. And, sometimes I make fried green tomatoes. They are so amazingly delicious. The green and red peppers are not hot. They are wonderful in salads, sauteed with onions and many other great dishes. As you can see I have a jar of basil. I make pesto and freeze it in pint jars. Tonight for dinner I used one big tomato chopped and the basil in the jar chopped. Drizzled the mixture with balsamic vinegar and olive oil. I also made stuffed portobello mushrooms, garlic french bread, fresh brined olives, and pomegranate juice with lemonade. And for dessert I served sweetheart and I a small dish of vanilla ice cream, sliced strawberries on top with one piece of chocolate and one chocolate chip cookie. Yes!!!! I love dessert. I would give up eating dinner to have dessert. I love to have company visit during Harvest Time or anytime. Don't forget to link back to Outdoor Wednesday and enjoy more outdoors. It looks like you have quite a harvest there. 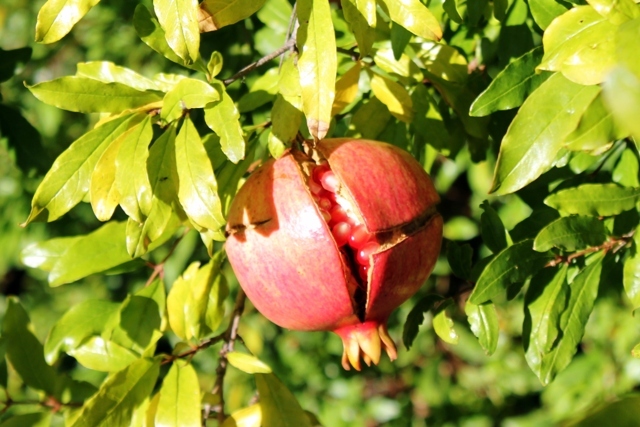 I had never seen a pomegranate before. Wow a very good harvest! And I love your shots too! Your photos are so lovely. I especially like the sun streaming through the trees. 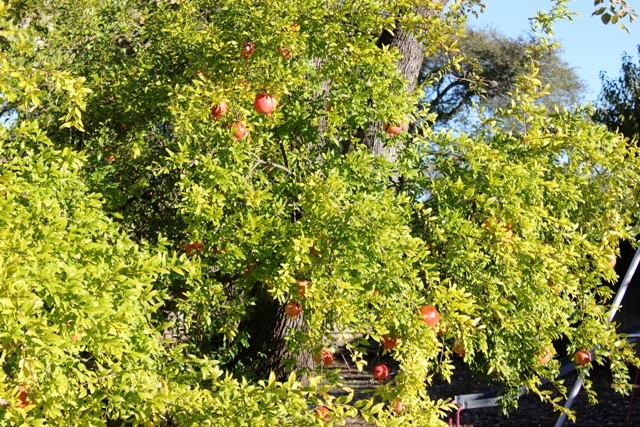 I've never seen a pomegranate tree before...or eaten one, my brother used to eat them a lot. I saw your "first Christmas to blog" comment at BNOTP and it drew me to your blog. My first blogging Christmas, and I can't wait! 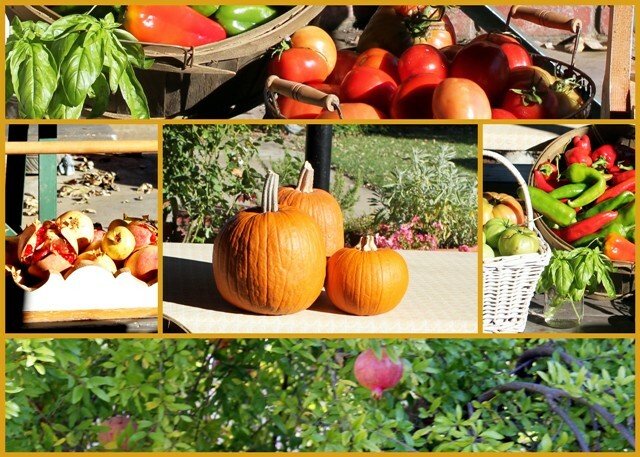 Your harvest is truly a bountiful one! Beautiful pics, too! I'll be following... And hope you'll stop by for a visit soon. Simply fabulous. 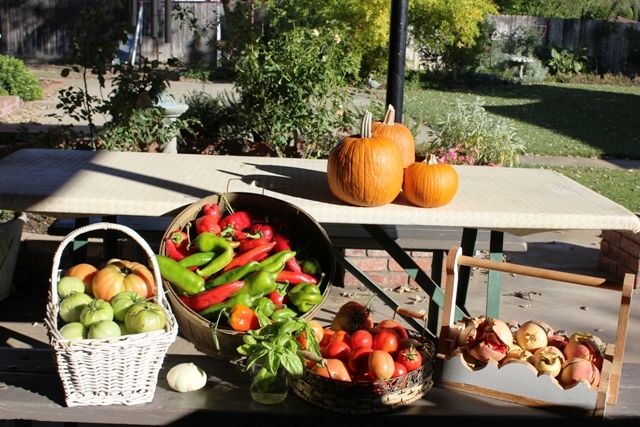 Love your Fall Harvest. xo - T.T.